Eighteenth-century blacksmiths often took their inspiration from nature. 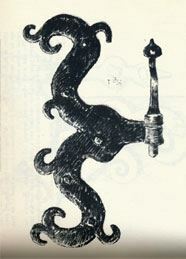 The staghorn, traditionally used on corner cabinets, gets installed with the scroll on the door and the "rat tail" pintle on the frame. Mark Aspery returns to the forge to help those advancing smiths create a stag horn hinge. For blacksmiths interested in adding to their skill set. This class is for smiths with CBA Level 1 or comparable skills.